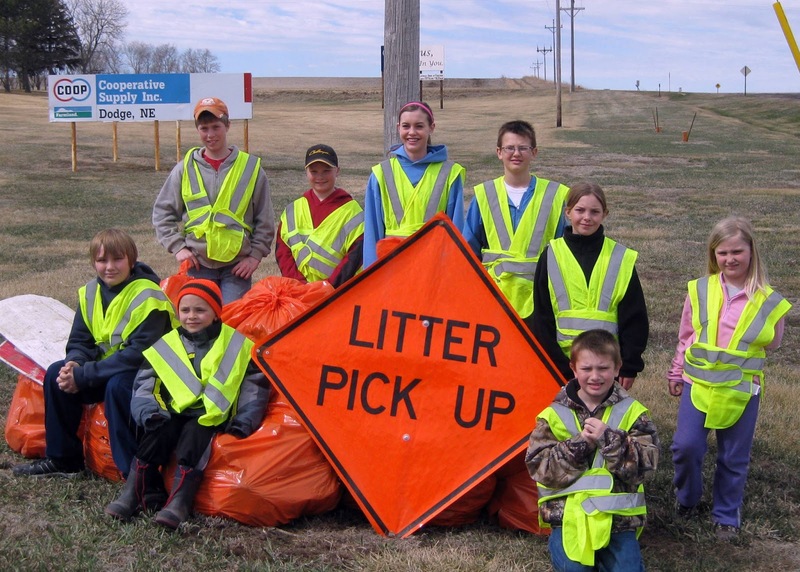 When I was growing up there was a slogan that went like this “Give a hoot, don’t pollute.” For me it meant litter control--not throwing trash out the car window. What I didn't realize in the 70's was that a movement was starting with a focus on air and water quality. That movement can be traced back to April of 1970 when Senator Gaylord Nelson created Earth Day. In December of the same year congress authorized the creation of a new federal agency to tackle environmental issues, the U.S. Environmental Protection Agency. We are very familiar with EPA regulations. 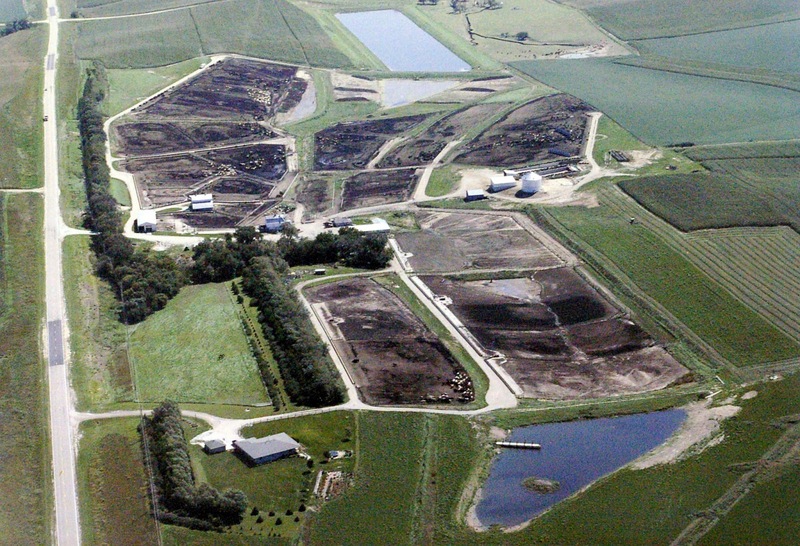 Since our feedlot is considered a CAFO we have certain rules to follow in order to operate. keep records of the water we use for irrigation from that pond. Earth Day is more than rules and regulations. It is about people returning to the earth more than we take from her. My husband, Steve, and I have been trying to do that ever since we started farming together nearly 32 years ago. One of our annual projects is planting trees. 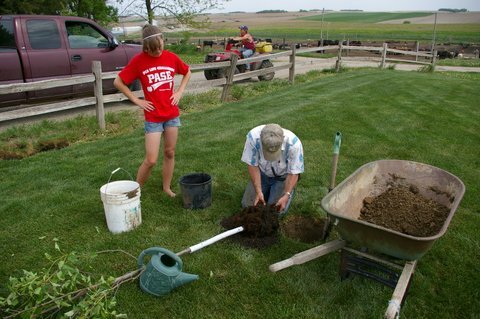 We started planting trees in the early 1980’s through a tree planting program through the NRD. Since then we have planted thousands of trees and shrubs. 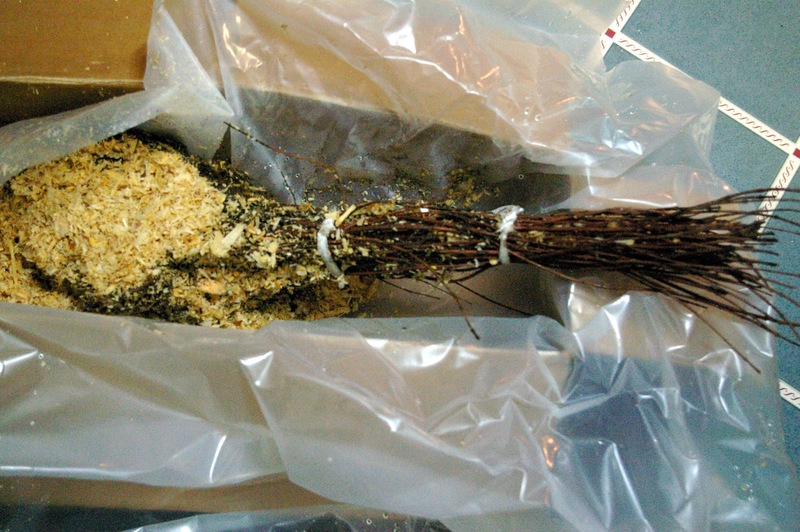 The NRD delivers them to us in bundles of 25 trees that look like sticks. this spring as soon as we get some warmer weather! 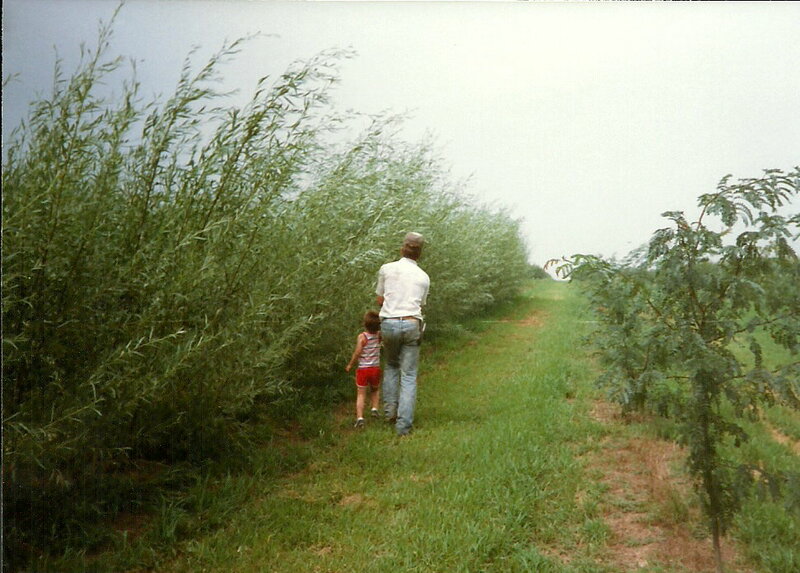 When Steve and I started planting trees we were developing windbreaks. We would plant two rows of Cedar trees and two rows of Ash trees. We started substituting Honey Locust for the Ash trees in the 90’s. We have also started using Pine and Spruce trees. Once the trees were planted we needed to keep them watered and the weeds mowed. We planted so many trees when the kids were young that I taught them math as they rode along with me in the pickup. We had a big tank on the back of the pickup with water and a large hose. As I would drive between the rows Steve would water the trees. As the kids grew they either ran the hose or drove the pickup. with a fast growing tree on the left called an Austree. Our kids also planted a tree of their own in our yard. Each of them received money from their grandparents to get a tree after graduating from 8th grade. It has been fun to watch the speed at which some of the trees have grown. Steve and Kim are planting an Ornamental Pear tree. Celebrating Earth Day is a something we do in agriculture every day. The earth is our partner and we know that without her we can do nothing. I encourage you to find ways you can give more than you take by following one of the newer slogans “Reduce, Reuse, Recycle.” Earth Day has become more to me than keeping our highways clean but that, too, is something that still needs to be done. 8-10 bags of trash for a 4 mile stretch we walk each year. 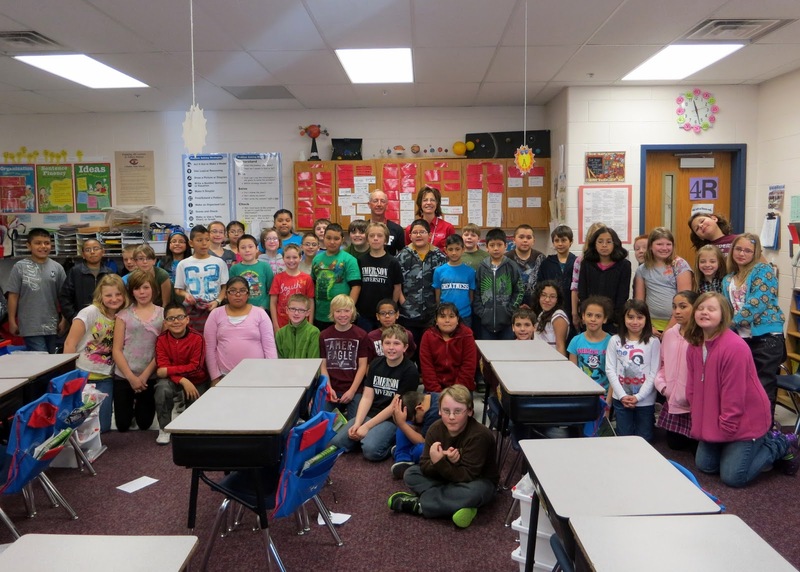 This past year Steve and I have been blessed to have two pen pal classes. 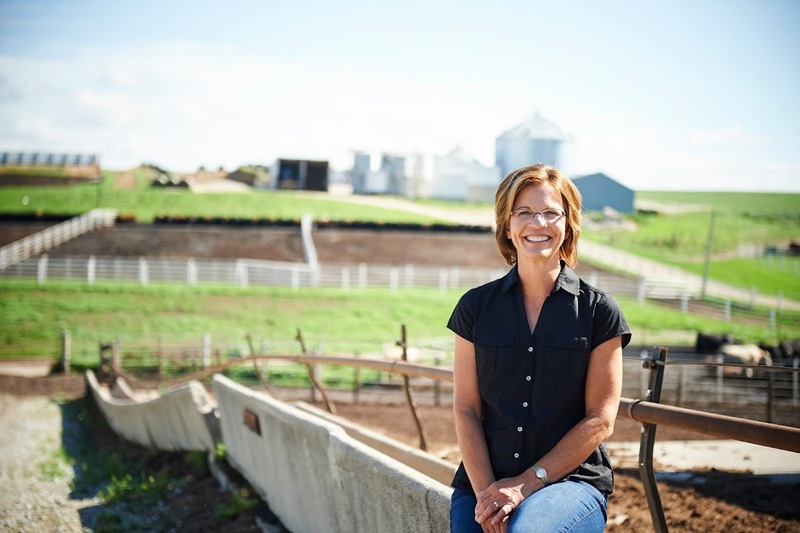 We participate in a program through Nebraska Farm Bureau that pairs teachers with farmers. Throughout the school year we send letters back and forth to get to know one another. We have been writing to fourth graders in Columbus and kindergartners in Omaha. The goal of the program is to connect children to agriculture. For a few years we were writing to a school in Lincoln. I remember how surprised I was at their questions. Do you ever go to Lincoln? 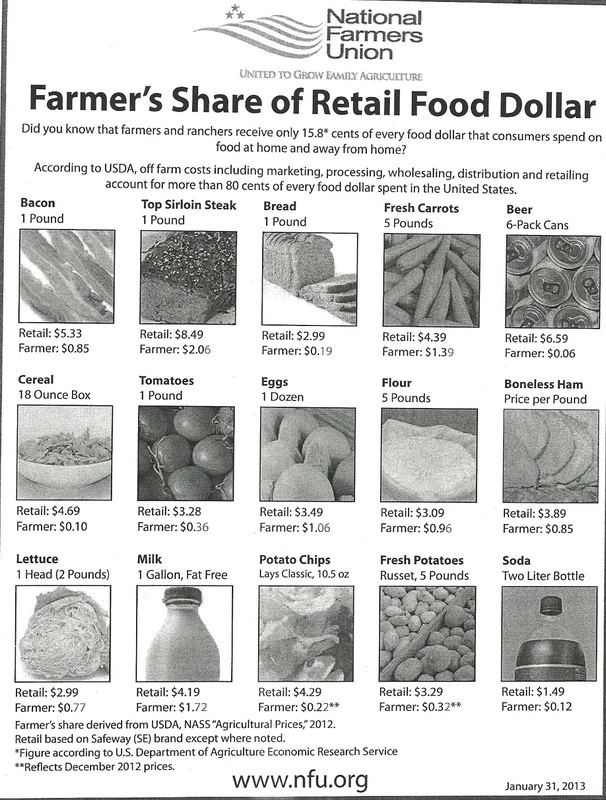 Do you grow all of the food you eat? Do you make your own clothes? I realized that there is a huge disconnect between what kids think about farm life and the reality of farm life. it on our window so we could enjoy reading it. Through letter writing we begin a relationship with the students. We begin by telling them a little about who we are, our family and what we do. The kids write back with questions about our lives and information about what they are studying in school. We respond with answers and some questions for them. We also like to send them things like beef jerky and soybean chapstick. of the total cost went back to the farmer. The highlight of the year is the classroom visit. Steve and I went to Columbus in March to visit our pen pals there. We brought pencils with hamburger shaped erasers and booklets about agriculture to color thanks to the Nebraska Beef Council We had an activity where the kids had to guess what the farmer’s share was of the cost of food. We had items like potato chips, flour, bacon, milk and a loaf of bread. The kids were amazed at how little the farmer’s share was for many of the food items. We talked about the what happens between the farm and the fork and how many jobs are tied to agriculture. with the kids for food prices. We also brought samples of ingredients we use in cattle rations. A repetitive question they had concerned how much the cattle ate each day. When we compared the amount to the size of the classroom trashcan they were amazed but satisfied. 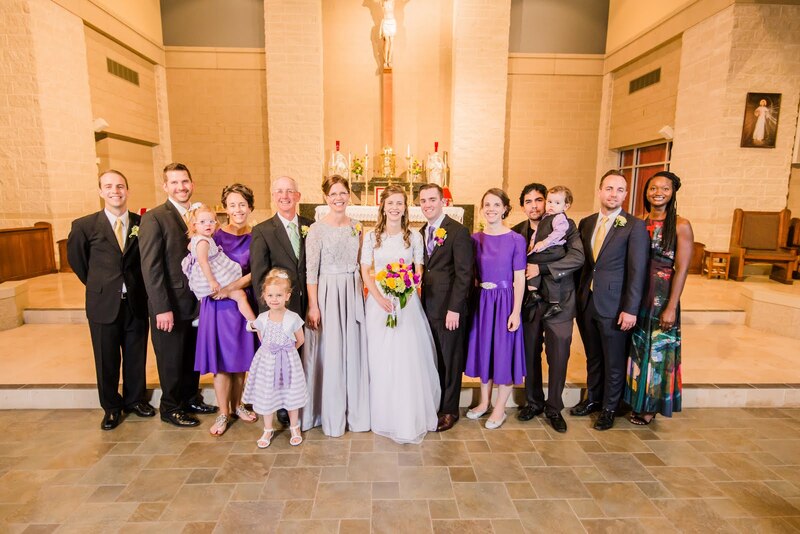 Before we left we gathered together for a group picture. put all of the fourth grade together for us to meet with. Last week I made a visit to our Omaha class. The school is located in a part of Omaha that was a little out of my comfort zone, especially when I had to go through some residential areas thanks to my GPS-guided directions. I showed up at the school carrying two big totes of items, a large poster board case and an easel in a homemade cloth bag. Fortunately the teacher met me at the door as I am sure I would have been cause for suspicion. 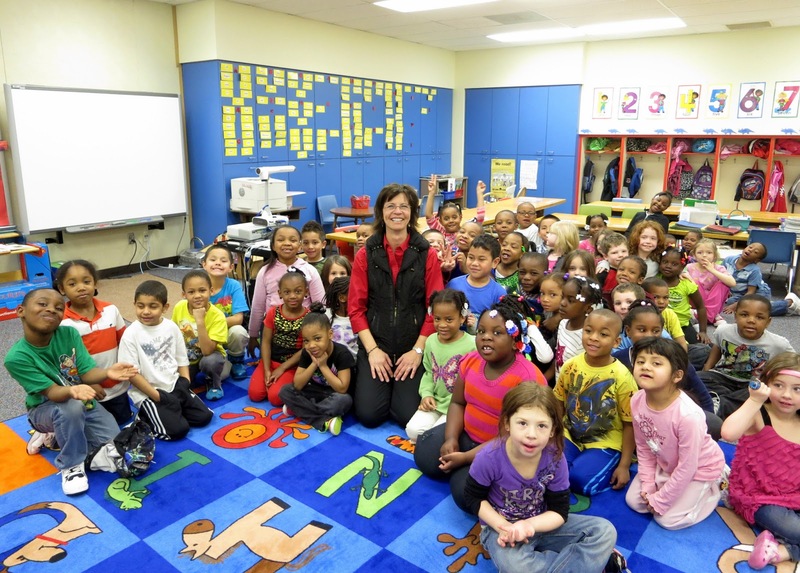 The 52 kindergartners were all sitting on the floor as I entered the classroom. I had some 11x14 photos on foam board to show the kids our feedlot and farm. As I was getting the metal easel out and adjusting the legs the kids were oohing and ahhing. I told them it was just an easel, not an implement from the farm! The teachers laughed and pointed to another wooden easel in the room to help them understand. The kids were awesome and so curious. We talked about how eating beef gives you ZIP (zinc, iron and protein) and how that helps you build muscles. We talked about taking care of cattle and the difference between animals that live in your house as pets and animals we raise for food. 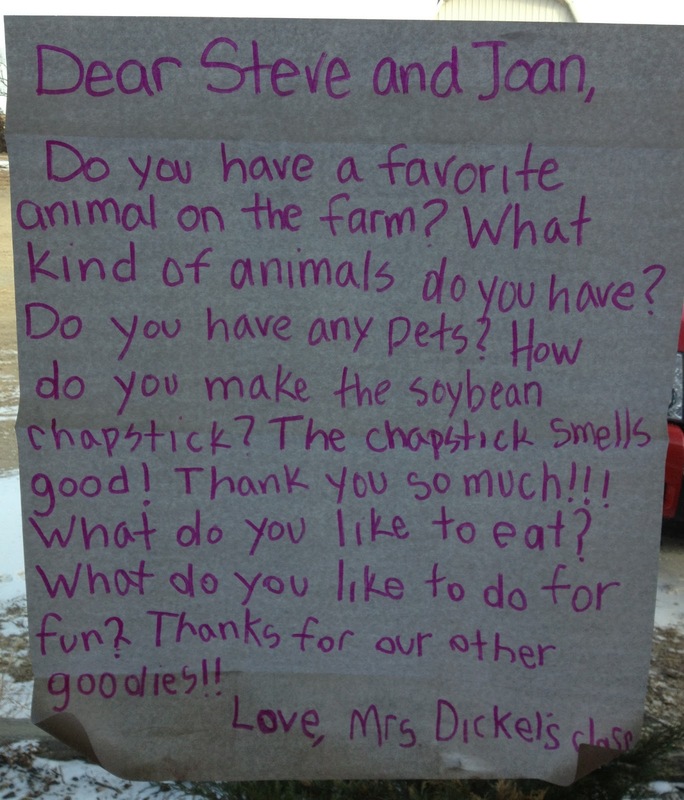 The kids asked me questions they had about our farm. Each of them had the chance to smell and touch the feed ingredients I brought. picture before they had to go to their next class. One group was left as I was putting my things away. A little girl came over and hugged my leg. It started a chain reaction as more of the kids came over and gave me a hug. Honestly I nearly cried. I was surrounded by these beautiful children who go home every night to the neighborhoods I was afraid of. I can only hope that the relationship we build with these kids goes beyond understanding agriculture. I hope they never forget how much we care.